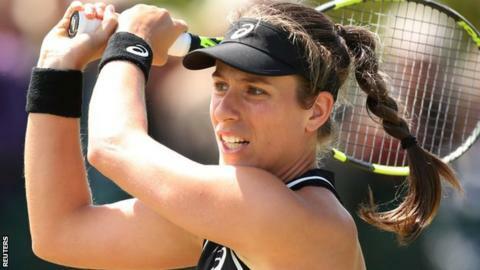 Johanna Konta continued her winning start to the grass-court season against fellow Briton Heather Watson at the Nature Valley Open in Nottingham. Fourth seed Konta, 26, won 6-4 7-6 (7-5) against her Fed Cup team-mate in a tight match played in gusty conditions. Konta, who reached the Wimbledon semi-finals last year, will play Slovenia’s Dalila Jakupovic in the quarter-finals. Meanwhile, Katie Boulter reached her first WTA quarter-final by beating 2011 US Open champion Sam Stosur. Konta, who reached the final in Nottingham last year, is looking to recapture the grass-court form which helped her climb to number four in the world after Wimbledon. She has since dropped to 22nd in the rankings and lost in the first round of the French Open at Roland Garros. Konta broke for a 3-2 lead in the opening set, Watson missing two break points in the following game before Konta served out to take the advantage. British number two Watson, who is ranked 91st in the world, edged 3-1 ahead in the second set, only for Konta to instantly break back and go on to take the tie-break. “It was not easy for either us and the conditions made it harder here,” said Konta. 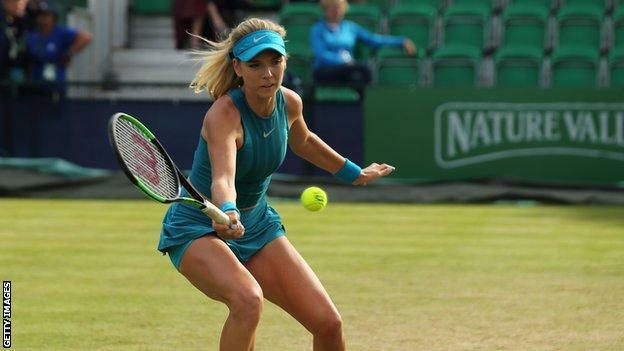 Boulter, ranked 53 places below 34-year-old Australian Stosur, won 7-6 (8-6) 6-1 to set up a potential last-eight match against top seed Ash Barty. The British number four saved a set point before clinching the first-set tie-break, then won five games in a row to close out the match in one hour and 18 minutes. “It’s a huge step for me. She’s a Grand Slam winner, and it’s the first one of those that I’ve beaten,” said the world number 156. It is the latest in a series of promising results for 21-year-old Boulter, who won ITF tournaments in Japan and Portugal earlier this year. Australian Barty plays China’s Yingying Duan later on Thursday. 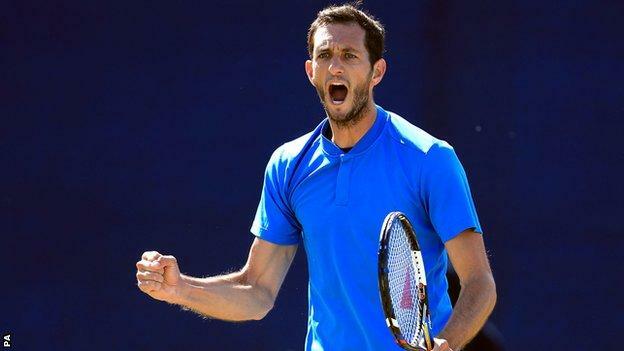 In the men’s draw of the Challenger event in Nottingham, Britain’s James Ward came from a set down against Australian Marc Polmans to win 3-6 7-6 (7-5) 6-4 to join compatriot Dan Evans in the quarter-finals. Ward will play fourth seed Ilya Ivashka of Belarus in the last eight. Meanwhile, British number six Harriet Dart shocked second seed Luksika Kumkhum in the last 16 of the Manchester Trophy. The 21-year-old won 3-6 6-2 6-1 against the Thai player who is ranked 104 places higher in the world rankings. However, British wild card Sarah Beth Grey lost 6-4 6-2 against Tunisia’s Ons Jabeur.